A cannon excavated from Blackbeard's ship, Queen Anne's Revenge. State archeologists say they have the ambitious goal of recovering eight cannons from Blackbeard's ship. The Queen Anne's Revenge sunk near Beaufort Inlet, North Carolina, in June of 1718, and the state Department of Cultural Resources has been leading efforts to recover artifacts from the ship since 1997. Divers use good weather during the summer and fall months to bring artifacts to the surface. Last week, bad weather prevented divers from starting their yearly digs, but Fay Mitchell of the Department of Cultural Resources says they hope to surface up to three sunken cannons this week. The cannons weigh up to a ton each and require a special crane to bring to the surface. 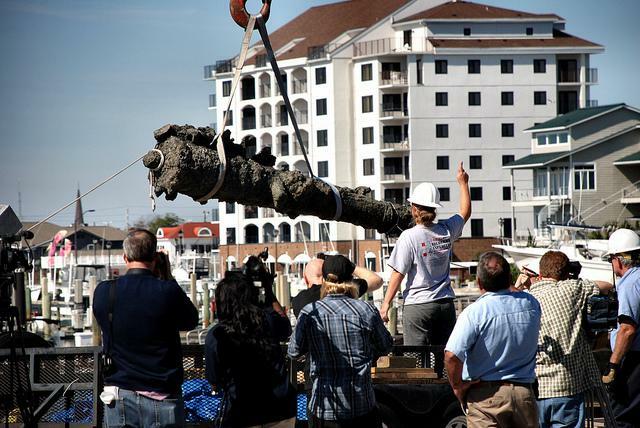 Divers last lifted a cannon from the wreckage in 2011. The excavation season ends in October. Learn more: The Story interviewed diver Rick Allen about his experience exploring Blackbeard's ship underwater with an iron arm and hand. At the bottom of Beaufort Inlet sits an eight-foot cannon that once fired from the decks of the Queen Anne’s Revenge. It’s been there since the ship sank in 1718, and the famous pirate Blackbeard was captured. A crew of archaeologists heads out to bring the cannon to the surface today. Mark Wilde-Ramsing is the director of the Queen Anne’s Revenge Shipwreck project and an underwater archaeologist with the state. He joined WUNC's Eric Hodge to talk about the project. Archeologists are unveiling artifacts recovered from the wreck of the notorious pirate Blackbeard's flagship today in Greenville. Many of the 122 items from the Queen Anne's Revenge will be sent to the North Carolina Maritime Museum and the North Carolina Museum of History. The pirate Blackbeard's flagship is the focus of a spring dive that begins May 23rd. The Queen Anne's Revenge went down off the North Carolina coast in June, 1718. Recovery efforts have been underway for years at the site of the wreck near Beaufort. Mark Wilde-Ramsing is the state underwater archeologist and is heading up the project. He says there are several goals for the two-week dive.